Dr. Trevor Dixon sits mumbling to himself in the emergency room at University Hospital during his shift on Labor Day evening. He scrolls through a spreadsheet on his computer that lists all of the evening’s patients. A resident physician calls Dixon over to examine a patient’s chest x-ray. “What do you see?” Dixon asks. He and the resident discuss options. His own residency training at Newark Beth Israel Medical Center six years ago gave him experience with a diverse population. He frequently encountered a large variety of medical issues that allows him to consider a wide realm of possibilities. 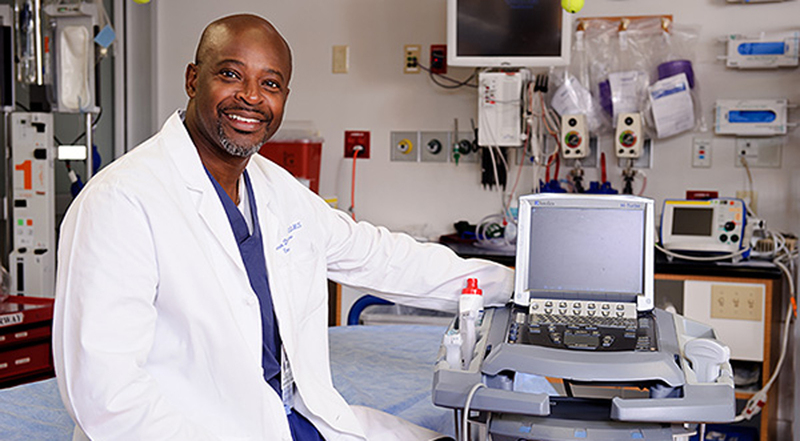 Dixon, chief of division of emergency medical ultrasound, was born in Jamaica and lived there for the first nine years of his life. His accent is not heavy, though sometimes he speaks a little fast and the occasional “mon” sneaks out. He stands about 6’0 with a thin goatee speckled with white. His bald head reflects the bright florescent light in the emergency room. He’s wearing an attending’s navy blue scrubs (residents wear light blue scrubs) and blue Crocs with a pin that says No. 1 Dad. There are two attending physicians working in the ER tonight. At least 20 residents and nurses are also working. Beside one resident physician and one patient, Dixon is the only black person in the emergency room on this particular evening. In fact, he’s one of two black faculty members in University Hospital’s emergency department. Dixon admits it can be uncomfortable at times, like he’s constantly under scrutiny. But being the only black guy isn’t new to him. During his first year in Columbia University’s post baccalaureate program, his 500-person chemistry class was mostly white. He relieves some of that tension with a good sense of humor. Dixon is usually smiling and likes to razz his co-workers especially after the 10 packets of sugar he dumps in his coffee. The School of Medicine is working on improving its diversity and inclusion. But is this endeavor worthwhile? In a talk given in 2011 by former dean of the School of Medicine, Robert Churchill, he recalls an anecdote from a chaplain at the Harry S. Truman Memorial Veterans’ Hospital that reveals how diversity can improve patient physician connection. The chaplain was making his rounds in the intensive care unit and observed a discussion between two doctors and a patient. All were from different ethnic backgrounds. The conversation wasn’t going well, so after the physicians left, the chaplain approached the patient to inquire. “I don’t trust the physicians, and I don’t believe anything they said,” the patient told the chaplain, who explained the distrust came from cultural differences. For Ellis Ingram, senior associate dean for diversity and inclusion, a diverse faculty and student body that mirrors the diversity of patients served at MU Health Care is a top priority. “If you scour the countryside for the best, then the pool is going to be diverse,” he says. The School of Medicine is working on improving its diversity and inclusion. According to the strategic plan for 2013-2014, all of the school’s deans and department chairs will attend diversity and inclusion organizational change training. The eight-hour workshop will be facilitated by Noor Azizan-Gardner, assistant deputy chancellor for diversity, and Greg Holliday, director of leadership development for University of Missouri System human resources. 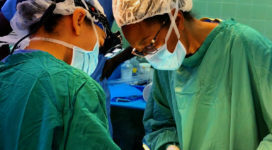 The Medical School also intends to increase scholarship funding for “groups historically underrepresented in medicine as well as learners from underrepresented socioeconomic and rural backgrounds” by five percent. These goals will be met by July 2014. Dixon returns to his computer and continues to analyze the spreadsheet. It tells him which patients he has seen, which still need to be seen, what tests the patients have been given, the results of those tests and other medical history. A trauma patient will be here soon, and he must be ready when the ambulance arrives. Nurses stand behind him waiting patiently for his attention. Residents bombard him with questions, and the phone rings constantly. “And this is a slow day,” he tells me. During his rounds visiting patients he introduces himself and asks the same questions over and over. How are you feeling? How long have you been feeling this way? Have you taken any medication? Are you allergic to any medication? Before he leaves the bedside, he might place a reassuring hand on the patient’s shoulder. “We’ll take good care of you,” he tells them. Dixon likes that part of his job—patient interaction. It’s one of the reasons the former ultrasound technician decided to become a doctor. But before his ultrasound training and before his first job with Consolidated Edison, a utility company in New York, the seed for his charitable nature was planted back home in Jamaica. Veta Mason stood outside her tiny home in Manchester, Jamaica every morning as children walked by on their way to school. She gave each one a banana from her farm. She also grew potatoes and yams. Every kid should go to school on a full stomach, she thought. Her grandson Trevor watched. Some days, after the kids were past, a man would approach her. “Got anything to eat today, Ms. Veta?” he would ask. She would return from inside her house with a bowl—his bowl—full of food. The man would eat, wipe his mouth and be on his way. Again, Trevor saw it all. The seed was planted. For the first nine years of Dixon’s life, his grandmother was his guardian. Around age nine, he moved to the United States with his parents. His mother, Hazel Dixon, continued to water the seed his grandmother planted. It was while living in the East Flatbush neighborhood in Brooklyn that his mother’s put-up-or-shut-up philosophy prodded him to go to medical school. Instead of complaining about it, why don’t you do something?Dixon recalls his mother telling him repeatedly. After earning an associate’s degree in chemistry from New York City Technical College, Dixon got a job with Consolidated Edison. He hated it. So he did something about it just like his mother told him. In 1994 he earned a bachelor’s in diagnostic medical imaging/ultrasound from the State University of New York-Downstate. Ultrasound, often thought of as a test only for pregnant women, was quickly becoming a standard test in emergency medicine for trauma patients across the country. Ultrasound prevents many unnecessary surgeries. It shows doctors if any free fluid, like blood or urine, from a punctured organ or nicked vessel is present. Without it, surgeons would have to cut a patient open or in some cases “crack the chest open” to investigate for free fluid. To crack the chest open means a surgeon divides the breastbone in order to operate. Dixon continued to Columbia University for a post baccalaureate pre-med program and then to the University of Medicine and Dentistry of New Jersey for medical school. He completed his residency training at Newark Beth Israel Medical Center. Although Dixon has lived in the U.S. for more than 30 years, his home country is still a big part of his life. In 2007, after he completed residency training, he flew to Jamaica. Once again he was confronted with something he didn’t like—gaps in Kingston Public Hospital’s care and quality of facilities. Dixon wanted to help improve the hospital in some way, though he didn’t yet know exactly how. When he arrived he met Dr. Hugh Wong, an emergency room physician. Wong was skeptical of Dixon at first. It wasn’t the first time an American approached him promising hospital resources only to flake out later. Before he left, Dixon handed him a business card. It read: Dr. Trevor Dixon, Emergency Ultrasound Education. In 2007, KPH received an ultrasound machine by donation, but it sat in a closet collecting dust. No one knew how to use it. Wong immediately called Dixon back. Ms. Veta gave bananas. Dixon gives lectures. “At that time KPH has one EKG machine, and you had to pay to use it even if you were having chest pains,” Dixon says. He couldn’t believe it. The next year, 2008, Dixon and his wife, Claudia, traveled back to Kingston and gave a free lecture to KPH physicians on ultrasound technology and its uses in intensive care and emergency medicine. “It’s all free because I want them to know what they’re doing when patients come in. So this is kind of like my donation to the people,” Dixon says. Since 2008 Dixon has returned at least once a year to lecture on emergency ultrasound. He also obtained and donated two slightly used ultrasound machines to KPH and established a foundation so he can continue giving lectures. 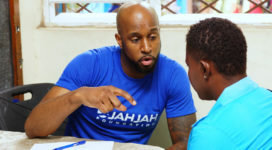 He named it the JahJah Foundation , which stands for Jamaicans Abroad Helping Jamaicans At Home. In the Rastafarian culture, the word “Jah” (a shortened form of Jehovah) refers to God. Through his foundation, Dixon also helped renovate multiple rooms in KPH and donated intravenous catheters, a defibrillator and other medical supplies. During his residency at Newark Beth Israel, Dixon was under the tutelage of Dr. Borenstein, who was recruited to Missouri to start a residency program in emergency medicine. The application to implement the program has been submitted, and the process is now in the review phase. A program could start as early as July 2014. When Borenstein left New Jersey, he brought Dixon with him. Dixon is one of those pioneers, and Borenstein knew he would be an asset for implementing an emergency residency program at the School of Medicine. Since 1994, Dixon’s trained several hundred physicians. In addition to working shifts in the emergency room at University Hospital, he now trains attending physicians in emergency ultrasound. Back in the emergency room, when things finally settle down for a moment, Dixon meanders to the break room for a snack. He empties a copious amount of sugar into his coffee and picks up a couple Fig Newtons and a granola bar. During this momentary break from being pulled in 10 different directions, Dixon’s thoughts drift to his family and to Jamaica. His transition away from his home and family on the East Coast hasn’t been the easiest. He misses his wife and kids. For the past year, Claudia Dixon has lived and worked on the East Coast while her husband works in Missouri. She’s a nurse anesthetist at UMDNJ Hospital in Newark, New Jersey. Their children, Jahmal, 4, and Jordan, 3, will start school in Columbia soon, but Claudia still does not have a job in Missouri. Usually, she says, she works two days a week — one 24-hour shift and one 16-hour shift. Then she flies to Columbia for the weekend to see her husband and two boys before flying back Tuesday. Jahmal and Jordan play in the backyard as we talk. “Jahmal? Are you OK? What are you doing?” Dixon calls out to him. Although Dixon’s boys never knew their grandmother or great grandmother, two of the biggest influences in his life, the legacy the women left with Dixon is not forgotten. Charity, compassion, acceptance and perseverance are values he demonstrates for his kids. He won’t let himself give up on the progress he’s made toward increasing diversity here. What kind of message would that send to his boys? His presence in the ER adds a breadth of possibilities for improving the quality of care at University Hospital. Dixon’s future plans for the School of Medicine is a partnership with the JahJah Foundation. “There are a lot of underserved areas throughout Jamaica that have no health services,” Dixon says. He wants to implement a study abroad program that sends students to Jamaica every month to provide basic healthcare.